The paper introduces the book crossing number problem which can be viewed as a variant of the well-known plane and surface crossing number problem or as a generalization of the book embedding problem. The book crossing number of a graph G is defined as the minimum number of edge crossings when the vertices of G are placed on the spine of a k-page book and edges are drawn on pages, so that each edge is contained by one page. We present polynomial time algorithms for drawing graphs in books with small number of crossings. 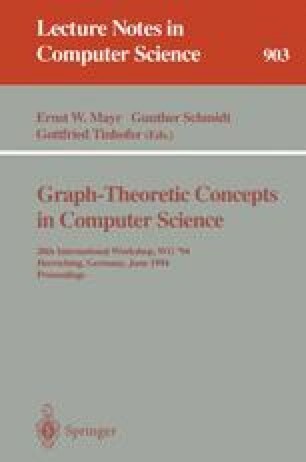 One algorithm is suitable for sparse graphs and gives a drawing in which the number of crossings is within a multiplicative factor of O(log2n) from the optimal one under certain conditions. Using these drawings we improve the best known upper bound on the rectilinear crossing number, provided that m≥4n. We also derive a general lower bound on the book crossing number of any graph and present a second polynomial time algorithm to generate a drawing of any graph with O(m2/k2) many edge crossings. This number of crossings is within a constant multiplicative factor from our general lower bound of Ω(m3/n2k2), provided that m=Θ(n2). For several classes of well-known graphs, we also sharpen our algorithmic upper bounds by giving specific drawings.